System.Exception: Could not create mail domain —> System.Exception: One or more of the settings you have specified is invalid. Can you double check the Services URL for me? If you open it in a browser it should give you the “SmarterMail Web Services” page. The URL will be something like http://192.168.1.100:9997/Services/ . Yes it goes through the web services documentation and lists all the available services. I also double checked my admin password for SmarterMail by logging through the web portal. Quite weird coz this is a fresh box and 1.01 was working for me two weeks ago. 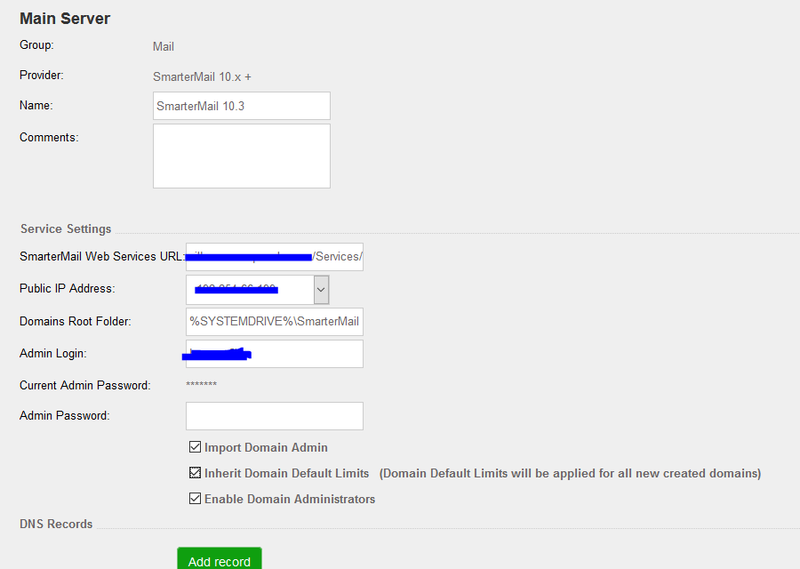 I have just tested the latest 1.0.3 on SmarterMail 15.0.5976 and it appears to be creating new domains and accounts fine. Can you try create a mail with a different domain? My webmail portal is on iis with ssl. Apparently https://my.webmail.com/services does not work. Putting it back to non-secured works. My main objective though was to force users to connect to ssl so i removed the http binding from iis. I guess i would just need to redirect users to the ssl site instead.